Every once in a while you hear an album that you simply can’t stop playing. I was recently given just such an album in the form of Echo Games by Katy Lied. It would be very easy to assume that a band with such a name would be a Steely Dan tribute, however, nothing could be further from the truth. Katy Lied wouldn’t be the first band to name themselves after a Steely Dan song or in this case album title, Deacon Blue named themselve’s after Deacon Blues from the bands Aja album. A tribute band they are not! 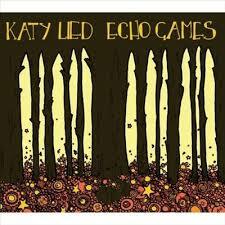 Echo Games is the bands second album and was released in 2009. The hub of the band is guitarist/song writer Duncan Hamilton, a man who’s musical enthusiasm knows no bounds and forms the nucleus of the band, singer Katie Harnett, Bassist Ian Thompson and seasoned drummer Paul Burgess who’s CV includes 10cc and Prog stalwarts Camel. Other musicians include singer Thea Gilmour, James Hallawell, Nigel Stonier and many more. Echo Games consists of ten finely crafted country folk songs the first of which is naughtily entitled Katy Lied. A jaunty up beat number complete with some great jangly guitar sounds. Katy Lied as an opening song and indeed as a band is and are breath of fresh air. There are many inflections throughout the album and in this case some of the guitar sounds remind me of The Cars. Paul Burgess opens the second song Mr Vertigo with a powerful stomp giving way to a soundstage packed to gunnels with various guitars, vocals, handclaps, tambourine, Dyambe and piano. A little more pop orientated than some of the other compositions yet remains bright and breezy. One of the highlights of the album for me is When It Rains. driving drums yet again make for a stomp of a song. Dai Smith’s electric slide guitar lending a Knopfler feel to it and had my foot tapping all the way through. Mini Moog making a cameo apperance here though you wouldn’t notice unless you listened intensely. A brilliant song to turn up the volume to and move some dust. Quite an angry song methinks. mean and enjoyable. The title song Echo Games slows the pace a little and highlights the sweetness of katie Harnett’s lilting voice which is given further support by Thea Gilmour’s backing vocals and the rasping edge of Liz Hank’s cello. Echo Games is without doubt the most atmospheric song on the album made so by Al Perkins haunting pedal steel guitar and Nigel Stonier’s keyboard pads. Elsewhere on the album songs like Watch This Space are given the country treatment with Rod Clements on Dobro and some great picking by Duncan Hamilton. This song had overtones of Crocodile Shoes. No bad thing in my opinion. A personal favourite of mine is A Little Rain which i feel i could identify with. Indeed upon hearing the finely crafted lyrics many people who have suffered hard times in there various forms will instantly bond with this song. Katie Harnett’s powerful voice hammering home the message supported by James Hallawell on Hammond organ. The emotion of a Little rain is lightened by the aptly titled Sun Comes Up. Swapping drummers brings about a lighter touch to the proceedings, Roy Martin’s deft touch with brushes makes for a light airy feel to this song. easy on the ear and very soothing, no doubt in part to both Al Perkins pedal steel and dai Smith’s electric slide guitars. The pen-ultimate song Somewhere We Can Go takes the band into a more folky area sounding very much like a Mary Black pastich before ending the album with the beautiful and bluesy Blue Wind. Katie Harnett is credited along with Duncan Hamilton for the writing of this song which does have a feminine feel to it. Once again the purity of katie Harnett’s voice makes this song a shear pleasure to listen to. Nigel Stonier’s Wurlitzer piano adds just a little atmosphere augmented by Liz Hank’s cello to bring to an end a really enjoyable album. What makes this album so strong is the quality of the writing and the painstaking attention to fine detail. Well crafted quality songs well executed by top notch musicians. Art work, booklet and packaging echo the quality of the songs and recording which incidentally benefits from hours spent in varios studios and not merely file sharing which sadly is the modern way. I found that Echo Games is an album that can easily be listened to late at night with the lights down low or with a little purchase on the volume control. Anyone whomlike myself were smitten by Clive Gregson and Christine Collister will simply adore this album. It is country folk yet in a very English way that i find so enchanting.